O.H. 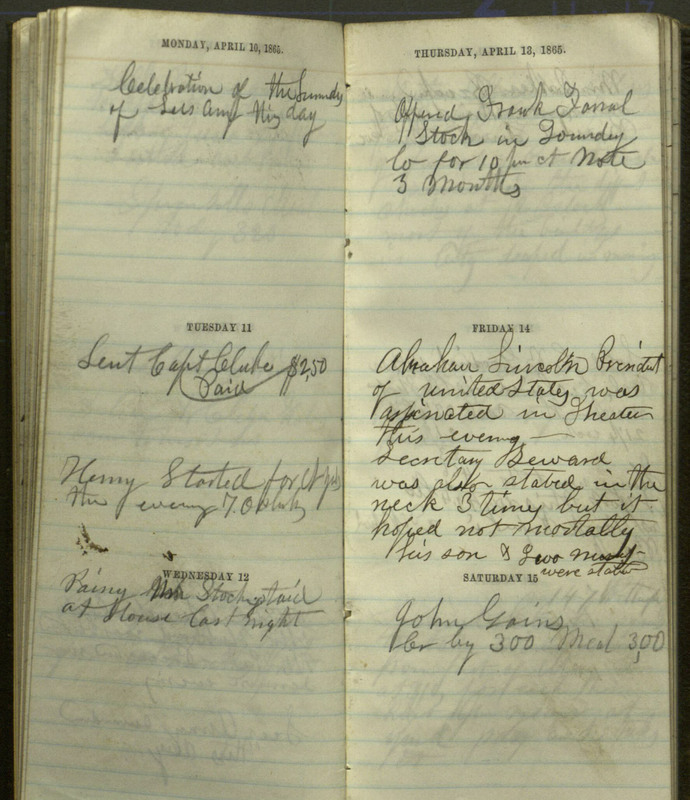 Bronson, a business person located in the Hartford, CT area, mentions the death of Lincoln briefly in excerpts from their diary entry on April 14, 1865. They make further references to the stabbing of Lincoln's Secretary of State Seward and church services being held to mourn and commemorate Lincoln's life in the Hartford area. The diary also notes that businesses would be closed for mourning the following day. played at house last night. Use of item for research, teaching and private study is permitted with proper citation and attribution to the Connecticut Historical Society. Reproduction of this item for publication, broadcast or commercial use requires permission. For permission, please contact the Connecticut Historical Society. chs.org/research/digital-reproductions.